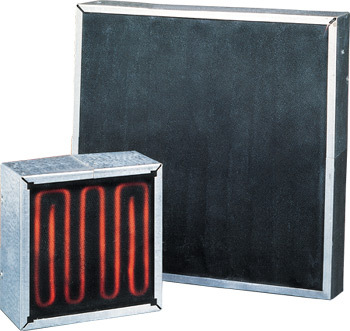 OMEGALUX™ QG Series heaters use a solid black Ceran™ glass as the emitter face. Maximum power output is 20 Watts/square inch with a maximum operating temperature of 870°C (1600°F) on the face. An optional thermowell from the back of the heater allows for a spring-loaded thermocouple to measure face temperature. This is the best way to use direct temperature control. The heater is available in sizes from 152 x 305 mm (6" x 12") up to 610 x 610 mm (24" x 24"). For medium power applications requiring a cleanable heater surface, the QG Series is ideal. For higher power applications, consider the OMEGALUX™ QC or QH Series heaters, which have a quartz emitter face. Heaters are assembled using screws as opposed to rivets, allowing for easy replacement of the glass in the field. Note: QG Series heaters are intended for “radiant” heat. Never let material to be heated come in direct contact with the face of the heater. It is recommended that overtemperature control be used to prevent overheating. 참고: Each heater comes complete with mounting hardware and complete operator’s manual.